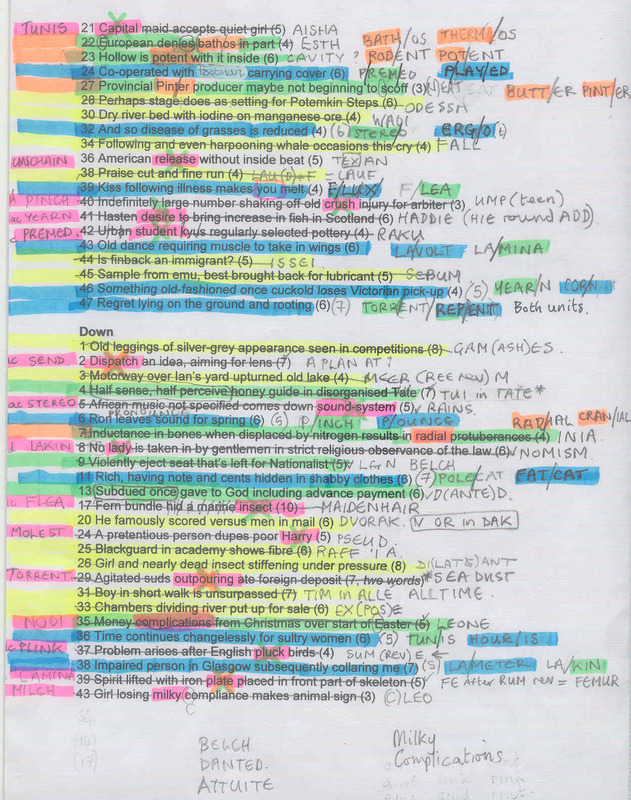 The first obvious feature of Dilwitch’s Downsizing was the gift of word lengths for the original words before we performed a bit of surgery and squeezed them into the grid. That had the numpties feeling very positive towards Dilwitch from the start. Can you imagine what this would have been like without that feature! Of course, this intriguing device had the great disadvantage that the wordplay rarely led to real words so we really had to do some cold-solving and rack our brains to understand what we were entering. It was lucky that (as usual) we spotted a long word in the south-east corner. We looked up types of gallery ‘Balcony for serenading girl in chateau (bit of skirt, not wife)’ (14) SINGING GALLERY reduced to SINGALERY. What sort of Don Juan is this Dilwitch? No doubt he was yowling ‘Love Me Do’, or another of those sixties favourites at that bit of skirt, from that balcony – though it wasn’t until we were attempting to understand the wordplay of our very last clue ‘Former teacher of George H – there aren’t many like me (8, two words) RARA AVIS reduced to RAVI S (Ravi Shankar) that we realized that the fab four had all figured in his clues. There were lots of lovely moments like that; it was spotting WAGGA WAGGA (reduced to WAGA) Comedian with a following, producer of Dame Edna (4) that broke the ‘do-able’ barrier for us – that moment when we have enough clues in place to have confidence that we might manage to finish. The grid fill was steady and enjoyable with more moments of delight, like 1ac Letters getting lost in paper press (11, two words) What a superb surface reading to tell us that we have an anagram of LETTERS in the FT to give us FLEET STREET. I was rather bothered by RATTON leading to RAT ON with the clue ‘Grass up? Why ‘up’? A friend has wondered why simply the word GRASS was not used. It would have been one of those classic Listener clues. NO NONSENSE leading to NONSE held us up too – what a clever find. All in all though, this was great fun and earned our admiration. What joy it must have been for Dilwitch when he managed to fit his last word in and every single one had been compressed. Lovely stuff! Thank you, Dilwitch. Yet another new setter this week, and a puzzle where we are told everything we need to know before starting. Here we had to reduce entries by dispensing with any repetition of consecutive identical letters or series of letters. I suppose it was a sort of extended Letters Latent. 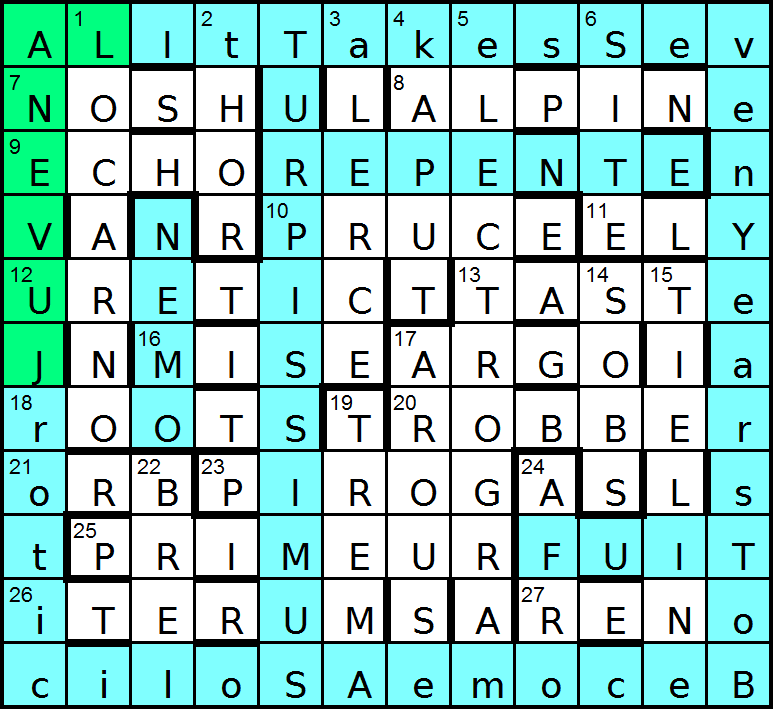 The wordplay led to the downsized grid entries. As it was to turn out, every entry was affected, some visciously so! 12ac GOOROO (GORO) was first followed by 13ac ENNUI (ENUI). And that was it for the acrosses! The down entries started a little bit better: 1dn FREEPORT, 3dn EFFUSIVE, 9dn PRINCESSES (PRINCES), and I thought I was off and running. As often happens, it was actually a crawl! Even comparatively straightforward entries like 11ac ROOFIE seemed to take me ages. 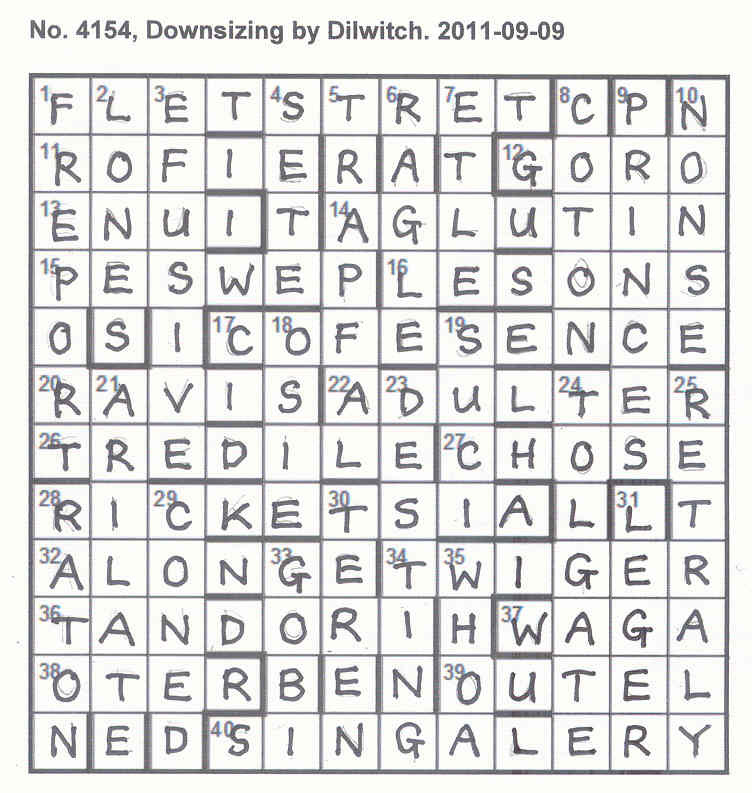 I won’t go into detail about how I solved Dilwitch’s puzzle; there were far too many long periods with nothing being written in the grid, and some of the longer entries (like WAGGA WAGGA, entered as just WAGA) took forever to decode (even though I’m a big Dame Edna fan). All I will do this week is highlight some of the clues which I found particularly entertaining; I think it fair to say that they were all fine with good/excellent surface readings. 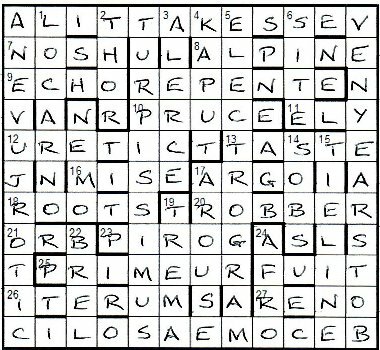 I think that the clues showed a maturity that was amazing in a debut puzzle, especially the outrageous clue 17ac Anglican forms collecting money? Here’s something for a drink (13, two words): SEN (money) in C OF E and CE (two abbreviations for ‘Anglican’), representing COFFEE ESSENCE! So how long did it take you? For me it was about five hours! Ouch! Well, I’ve been dancing since this came off the printer over twenty-four hours ago, and a merry dance it was. I studied Measure for Measure intensively many years ago in a final Uni year and don’t remember much about it except that it was a rather nasty play that led to Mariana in the Moated Grange by some other author who thought it was rather tough on the lady. This one was! Elbow and Froth indeed! Those ten letters, or at least, nine of them, came very quickly as the fourteen normal clues were transparent and fell neatly into place. What a pity that they were concentrated in the lower part of the grid with that yawning empty upper half! The one that we failed to see was DILATANT. Fairly obvious, I know ‘Girl and nearly dead insect stiffening under pressure’ Di + lat(e) + ant, the usual insect (when it isn’t a tsetse fly), but we had FLUX intersecting with it, where we should have had FLEA, a different insect. We hadn’t understood what was going on. We still hadn’t understood as midnight approached. By then we had realized that the extra words, ‘sound-system’, for example, were pointing at other lights, like 32ac, where STEREO fitted. We had an almost full grid and mystification. What was the link between FLUX and FLEA, between TORRENT and REPENT, or between LAVOLT and LAMINA, or, for that matter, between ERGO and STEREO? Clearly there was nowhere for us to slot in those words that were actually produced by the clues, so there had to be a reason for their existence. A common factor? Understanding that it was units that they had in common (a STERE and an ERG, a VOLT and a MINA, for example) was a great breakthrough but also a real shower of depressingly cold inspiration. 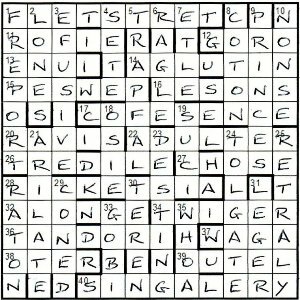 Even the wonderful Mrs Bradford didn’t have all the units or measures for this crossword (is that 15 X 2 in modified clues, 5 X 2 in clues where a word had already been modified and a final 2 in the mini endgame? A total of 42 different names for units? I am not much good at the number thing – sorry Roddy – so perhaps someone will correct my reckoning!) 150,000 weights and measures existed in France alone, before the Revolution, so things were looking gloomy. When was the last Listener when one could have a complete grid and hours of work still to go? Of course we had to work through every clue again and allocate the extra words carefully in order to find out which was our ‘untouched clue’ that had to be similarly adjusted. We had OEBWLHRFOT as extra letters and the other numpty retired to bed saying ‘That looks like ELBOW. Isn’t there some ELBOW character in a Shakespeare play?’ I wish I had listened. Isn’t hindsight great? When I looked up the Wikipedia entry on ELBOW, all I got was a band called Elbow! I have worked almost as long on this one as on those Knights’ moves and still don’t know what the actual clue answer for 19ac is (Rarely hated bag put in order (6) – it sounds just a bit like a description of Measure for Measure’s Mariana) but we know that SEND went into the light and matched up with ‘dispatch’. Not only that, but we have placed them all and had only ‘milky’ and ‘complications’ left over and three places where those two could go. BELCH (Violently eject seat that’s left for Nationalist) has to yield to MILCH and that creates ‘complications’ in NODI. Our other two untouched clues to ATTUITE and DANTED remain pristine and we slot MEASURE FOR MEASURE below the grid. A merry dance indeed. Let me not be unjust. 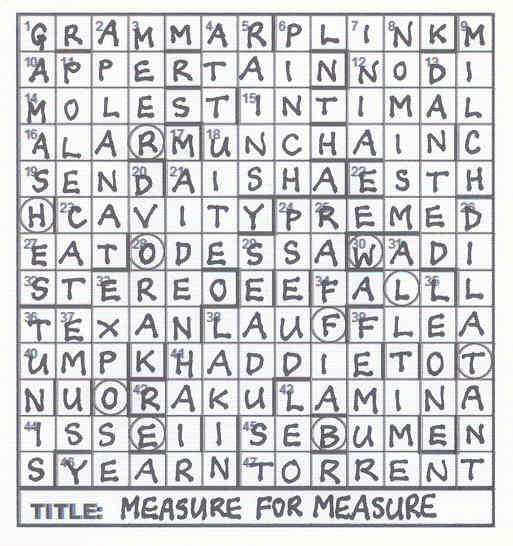 It would be totally unfair to have anything but immense respect for Brimstone for the creation of this astonishingly weighty crossword. It is my own shortcomings that have made it such extremely hard work. Many thanks, Brimstone. According to my records, Brimstone is one of a handful of setters who dabbles in the mysteries of the mathematical puzzle as well as the standard crossword. This is his third Listener, his last being a maths one, namely Base Jog and its Ruth-Aaron pairs of numbers (714/715). He has also set a number of Magpie puzzles, again with a mixture of word and number offerings. This week, we had 15 clues requiring modification before entry with a similar change being required in 5 other clues. 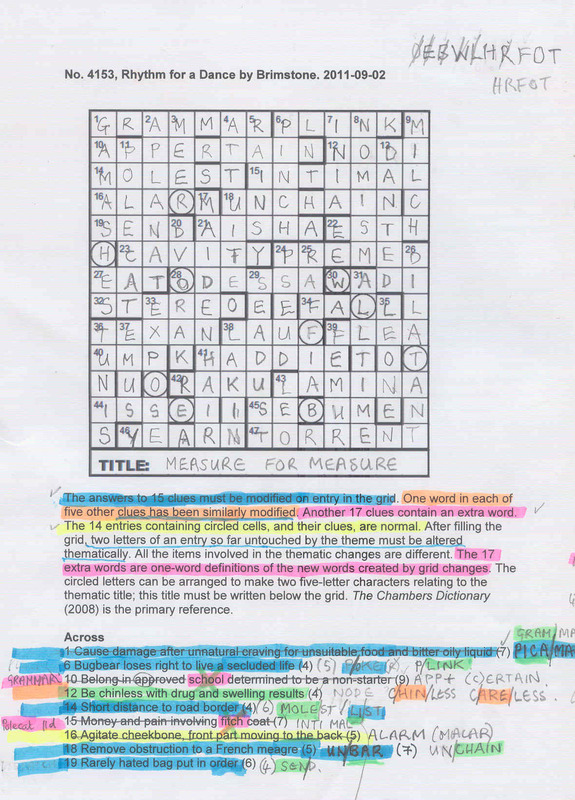 There were extra words in 17 clues which defined the modified entries, and 14 entries ran through squares with circles, and these were normal; I circled the clue numbers for these. What I didn’t realise until I was way into the puzzle was that 15 + 5 + 17 + 14 did not equal 54 (the number of clues), but 51. There were 3 entries that fitted none of the categories listed and turned out to be normal clues. 1ac eluded me, but 6ac was POKE and was an entry requiring modification as it needed to be fitted into a five-letter space. 16ac ALARM came next, and then 22ac European denies bathos in part (4). Almost certainly a hidden clue, and probably one of the five that needed modifying before solving. It seemed likely to be ESTH, with the ba of bathos needing to be removed. Looking again at the PO in POKE at 6ac, and reversed consecutive letters seemed to be involved … perhaps. Precious few clues were solved in my initial run through them, the last being at 36dn which was HOURIS, and bang went my reversed consecutive letter theory! And unlike POKE, it had to be fitted into an entry space that was shorter. Soon after came 32ac ERGO which had a 6-letter space, 38dn LAMETER which had 5, and 43ac LAVOLT that had no change in entry length. It did, however, give me the answer that I was looking for, since VOLT stood out like a sore thumb. A fairly early discovery of the theme I thought … until I looked at the stopwatch to see that it had taken about an hour and a half to get to this point! So it looked as though units of measurement were involved, and LAVOLT looked as though it would become LAMINA, being defined by plate at 39dn. What’s more MINA was also a measure, being a Greek weight. So one unit or type of measurement needed to be replaced by another. I thought, of course, that it would be plain sailing from then, but Listeners can be deceptive little blighters, and it took the best part of two more hours to finish the grid. The final change required to complete the puzzle was to change BELCH at 9dn into MILCH, changing NODE to NODI in the process. 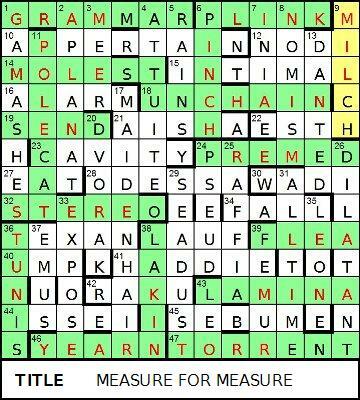 These two entries were defined by the extra words milky in 43dn and complications in 35dn. 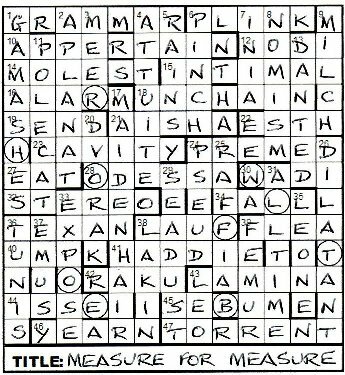 It didn’t take long, of course, to suss the title that was required to be entered beneath the grid: Measure for Measure, and from there to discover the two characters ELBOW and FROTH given by the letters in the circled squares. The title gave two definitions of measure. A good puzzle from Brimstone, not too difficult and thoroughly entertaining … just as I like them. Just as there are some setters whose puzzles you dread as soon as you see their name, so there are others where you feel (hope?) you may be in for a slightly easier week. Mr Lemon is among the latter category for me, although his Enigmatic Variation puzzles (under a different pseudonym) can be a lot more tricky. And one day, I know he will buck the trend and cause us a real headache. Four unclued entries provide a quotation, with its author and a rejoinder to be found in the perimeter. 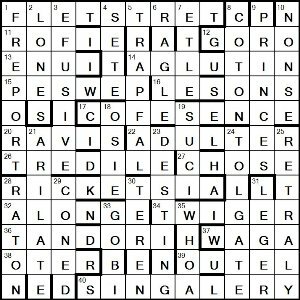 Misprints in clues would provide the unclued perimeter letters. I will admit now that about half an hour into the clues I had been making a note of the correct letters alongside each clue, rather than the misprints. How many times have I done that?! Not that it was particularly important at this stage, since they would only really be needed to verify the perimeter. Mr Lemon did not let me down; I zipped through the clues pretty quickly. Although there were only 28 of them, the unching was probably fairly higher than normal, what with the unclued entries and the perimeter. So, for example, 12ac URETIC only had the R and the C actually checked by down entries. Perhaps that was why the clues were not difficult, and I finished the grid in one hour twenty minutes. No doubt many of you out there finished it considerably more quickly. The four unclued entries read: ••PE•T•, F•I•, T••PISSIMUS and •EMO. It looked as though it was a Latin quotation, and, since there was no reference work given for it, it seemed likely that it would be one of those in the back of Chambers. It didn’t take long to find “nemo repente fuit turpissimus“, translated as “no one ever became utterly bad all at once”. This was by Juvenal, a Roman poet in the first and second centuries. His name was in the top left corner of the perimeter, and the rejoinder (rife in the profession concerned) was soon revealed as It takes seven years to become a solicitor. That must be an in-joke — ah, hence the title. Probably used a lot in the Inns of Court — ah, hence the title! I confirmed that all the unchecked letters matched the misprints and the job was done. As always when completing a Listener at the easy end of the spectrum, I suspected that a stinker was waiting in the wings. We shall see.